The home owners association bought the park recently: all buildings freshly and tastefully remodeled, all grounds re- landscaped, wonderful friendly knowledgeable staff, kid and dog friendly, groomed walking trails, indoor pool and hot tub, outdoor pool and hot tub in-season, great club house with pool tables, ping pong tables, huge flat screen tv, large clean laundry facilities, beautiful clean restrooms and showers. 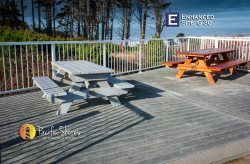 Private access to miles of beach, spectacular unobstructed views of Yaquina Head Lighthouse, incredible sunsets, whale watching from cliff side gazebos, easy access for Big Rigs up to 45 feet, all sites have full hook ups with 50 amp, coaches only: minimum 25 feet, no camper trailers or tents permitted. Plenty of parking for towed vehicles on each site. We travel winters, with a Boxer and German Short Hair Pointer, from Seattle to San Diego to Key Largo in a 45 ft Tiffin Motor Coach, our opinion is Pacific Shores is one of the finest RV parks in the U.S. This is an excellent, high class, fair priced, RV resort in Newport OREGON. We we scheduled to stay at Beverly Beach State Park but our big rig couldnt fit. We ended up coming here and are so glad we did. Two pools/hottubs..one indoors and one outdoors. Great clubhouse and trails to the beach. You can also buy a deeded lot in this resort. It is GREAT! Pacific Shores MotorCoach Resort was so easy to work with! Id definitely recommend them to all my friends and family.